The carbon storage capacity of protected forests in West Africa has increased despite the region suffering a 40-year drought, a study suggests. A team of UK and Ghanaian researchers found that the tree composition in these areas favoured species that were able to cope with drier conditions. Previous studies suggested that drought conditions resulted in less carbon being stored as vegetation died. The findings have been published in the journal Ecology Letters. "Despite the long-term drought, there was no biomass loss in the forests. In fact, the biomass actually increased during that period," explained co-author Sophie Fauset from the University of Leeds. Biomass is a vital component in the global carbon cycle. When plants grow, they absorb carbon dioxide and water in the photosynthesis process. While oxygen is released into the atmosphere as a waste product of this process, the absorbed carbon primarily remains locked in the plant until it dies. "We think it is the result of a shift in species composition," Dr Fauset said, explaining why the study showed an increase in biomass. "Because you have got this long-term environmental shift, it is possible for the species composition of the forests to reshuffle slightly, so the species that can survive under those conditions are favoured. "This means you are getting less negative impacts of the drought." 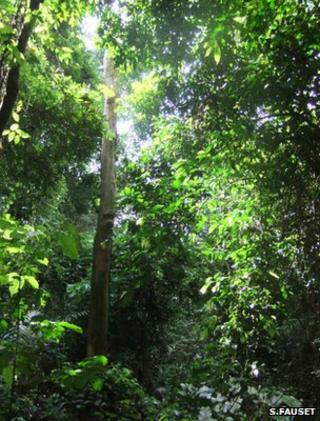 The team of UK and Ghanaian researchers tracked more than 10,000 trees between 1990 and 2010. The West Africa region has experienced drought conditions since 1970. Rainfall has fallen by up to 23% compared with pre-1970 levels. Dr Fauset said the study widened the current thinking on the consequences of drought conditions on an area's flora and fauna. "It is generally thought that if you have droughts then you are going to see a decrease in biomass," she told BBC News. "Certainly, studies that have looked at short-term, quite extreme droughts do seem to show biomass loss. "It could be that the increase in biomass (recorded in this study) could be the result of something else, but we think that the maintenance of the forest structure, despite the drought conditions, is a result of a change in species composition. "This basically means that you cannot take those short-term studies of extreme droughts and extrapolate the findings to a long-term event with different kinds of precipitation changes." Findings presented at an international forest conference earlier this year found that tropical forests in Africa may be more resilient to future climate change than the Amazon and other major forest regions. It suggested that the region's surviving tree species had endured a number of climatic catastrophes over the past 4,000 years. As a result, they were better suited to cope with future shifts in the climate. The continent's tropical forests form the second-largest continuous forested area in the world. Dr Fauset observed: "It is very important for the global carbon cycle that these forests are maintained."